I have just downloaded the plans for a Frog Diana 36 inch wingspan glider. I notice that there is a "string fuse" at the end of the fin. Can anyone tell me what it is for? This is my first attempt at building a model glider! I'll take a guess that this fuse is inserted into the rubber band holding the trailing edge of the tailplane down, and that there is a wire hook arrangement on the leading edge with a second rubber band engaging this wire hook and passing around the fuselage thus holding the front of the tailplane down. This arrangment is known as a dethermaliser, when the smouldering fuse melts the rear rubber band the front band pulls the tailplane up to an angle of about 30 degrees, fully stalling the model which then comes down like a parachute. It was aimed at limiting flight times to a few minutes and hopefully preventing the model vanishing upwards or downwind if it caught a thermal. Of course what Bob and Pat describe is for free flight and not needed if using Radio Control. There are still a few people flying free flight now but it needs plenty of space and that's not easy to find. So most use RC. 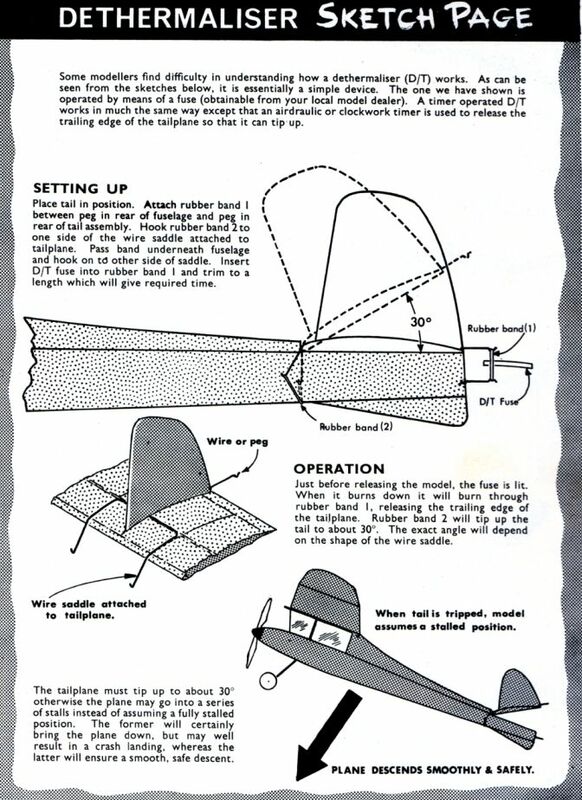 The next question is do you want to make such a small glider for RC or make something which is easier to see? David maybe you should ask the question " which is the best glider for a beginner to build from plans "
Thanks to Bob and PatMc you both have clarified my question nicely. In answer to kc's question, Ok, what is the best glider for a beginner to try to build from plans? IMO around 6ft span is the best size for decent performance, visibility & ease of build matched to bouncability. The Orangebox plan downloadable here is a good example, they are simple to build, robust, good control & have a decent performance. Personally I'd make a couple of simple mods. I'd make the wings 2 piece for ease of storage & transporting. Also I'd change the fin & rudder to have a vertical hinge line in order to have a sensible horn linkage & for aesthetics. There are a few 'different' gliders. Are you looking for a free flight glider or radio controlled ? Do you have a flat field to fly or are there hills and slopes ? Do you want a hand launch, (just throw), tow line, or catapult launch ? There can be differences in the design, and how you would like it to fly, they could influence an suggestions. Not trying to be awkward, just trying to get an idea of what you want to give you the best chance of a success, and a good introduction to modelling if this is your first model. I'd agree with pretty much all of that Pat. I've got an old Orangebox and one of the great advantages of the way the fuselage is built really helps a beginner to get a straight, accurate fuselage. Mine has got wings that split in the middle using brass tubes and piano wire dowels. Mine has the fin and rudder with angled hinge line which works ok with a closed loop linkage, even though as Pat says it is not great aesthetically. It does go well from the slope or flat field (I've bungee launched it and used a power pod over the years). It's a tough, no-nonsense design! David, a small model might appear to be an ideal solution for a beginner, but in reality they can be tricky to construct accurately, and you may well wind up putting a lot of effort into something that is frustrating and won't perform well. Give yourself a fighting chance and select a glider of around a couple of metres wingspan and see how you get on. A Balsa Cabin Sonata kit is a good one, inexpensive , can be configured as a sloper or thermal soarer or for electric power. With a little care it'll.be a guaranteed performer. PatMc, I've been toying with building a flat field soarer, is a 100s type much better than an Orange Box type. I would like a casual low key machine, probably with a motor on the front. Plan build. Not a great investment in time. Thanks for replies. I haven't started building yet, so advice on best model type would be most welcome. I would like to start by making a F/F glider. I know a rural site on a small hill that I thought would suit hand launching ( perhaps discus launch?) and a fuse arrangement - just incase I get lucky with my first plane! I will download the "orangebox" plan to have a look as well. (hopefully it will work), there are loads and loads of model plans free to download off the web, many are in .pdf format and can be scaled to whatever size you require. Don, from the performance POV the greater the wingspan the better. When I previously mentioned 6ft span being good it was with David's lack of building & presumably flying experience in mind. IMO 6ft is about the minimum span generally for a decent thermal performance & visibility but about the max size for the other factors mentioned. A 100" span glider would be a step change in overall performance & flexibility compared to a 6ft span. Mind you if I was considering scratch building a 100" sports thermal glider I'd go to 108"+tips span as balsa wood comes in 3ft lengths. Ooh - it would also have an electric motor up front driven by 3s lipos. I suggest you look at what the local clubs do - you will get an idea of whether a glider or perhaps a motor glider might suit you. Gliders with a small electric motor are popular now. If free flight is your thing then it's worth finding out what people do nowadays - I think fuses are thought to be a fire risk and some sort of timers are used now instead. Free flight is a specialist thing and quite rare now but there are a few real enthusiasts somewhere. Look at the BMFA website for info. I think that even free flight gliders would be covered by the laws that prevent flying within 5 k of airfields so you need to be careful where you fly and also have insurance. Thanks for everyone's input. I feel that there is real depth of knowledge on this forum. I feel like I am wanting to go from zero to 100mph before even learning to drive, but that is just the way I am, I usually choose the steepest learning curves when I decide to try something new!. One last question. After looking at lots of designs,( and I think that there are so many that it is starting to confuse me as to what to choose! ) it appears to me that the gliders with a "stick type" body should be easiest and quickest to make. Am I correct, or am I overly simplifying things? A square box is the easiest to make because it is the easiest to get everything square, and symmetrical. If you are starting out, a good kit is IMO the way to go, because you have some instructions to follow, and the wood supplied will be fit for purpose (hopefully). PatMc, thank you for that, I will store that knowledge away. I have just noticed that the "orangebox" is a radio controlled model. I want a F/F model. Will the orangebox work F/F . Is it a case of getting it to balance at the C of G. Anyone know the answer? If you are looking for a FF glider then Ripmax have just started producing Keil Kraft kits again and they have the Caprice and Invader models. Steve Webb models have them on their website. Belair also produce some laser cut parts for FF gliders but you will need to by extra wood and get hold of the plans for some. If you go down that route the Mercury Gnome is an easy build and very robust for your initial attempt - you can down load the plan from OUTERZONE website.